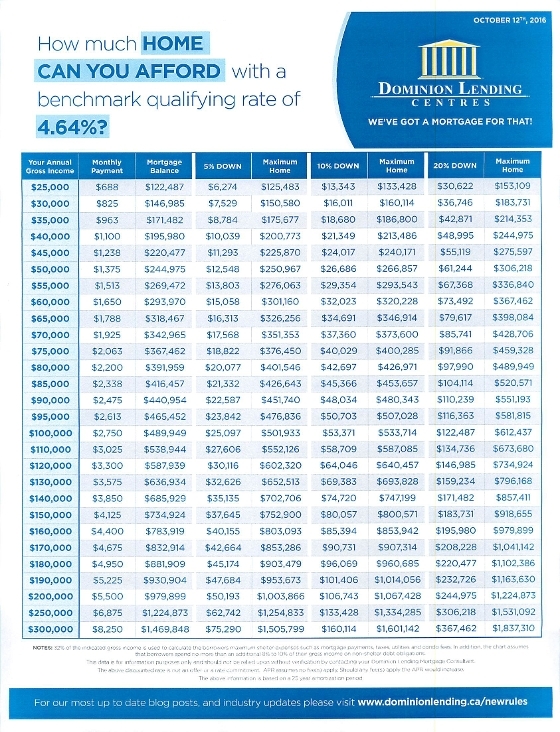 New Mortgage Guidelines "The Stress Test" and How Much Can You Afford at the New Rate? I've been reading about the Federal Government's new mortgage guidelines introduced this month. The Feds have introduced these new guidelines because they want to protect the long term stability of the housing market in Canada. Here in the Lower Mainland home prices are higher than almost anywhere else, except perhaps Toronto. So by introducing the "stress test" requirement for buyers with less than a 20% down payment, the government has basically given those buyers approximately 20% less purchasing power to work with. For first time buyers, this may well be just one more hurdle to home ownership. Previously buyers just had to qualify for a mortgage at the lender contract rate which has ranged in the 2.39 - 2.79% range for a 5 year fixed term. Now, the home buyer must qualify at the Bank of Canada rate (which is currently 4.64%) for a maximum 25 year amortization, with a maximum property purchase price of $999,999.99. Potential buyers will have to have a minimum credit score of 600 and a maximum gross debt service of 39% of the home buyer's income . So far, those home buyers who are able to put down at least 20% down aren't facing the same challenges. What about refinancing mortgages? At this point, home buyers will still be able to refinance up to 80% of the value of their property. Now, more than ever, you need to ensure you have all the information at hand to make a wise mortgage decision. Enlist the aid of an experienced, well-qualified mortgage broker to give you all the tips and help you need.